Come Sail Onboard Wayward Sailor! the readers of the Virgin Islands Daily News! 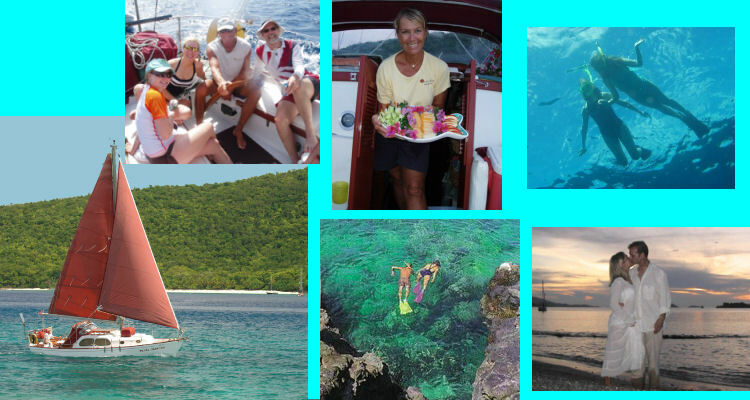 Come Sail and Snorkel with us for the BEST day of your vacation! "the ultimate in personal service"
"A day sail on the Wayward Sailor and snorkeling with Capt. Phil Chalker, a marine naturalist, is a must". Other than the awards, why should you sail with Wayward Sailor? All inclusive full day and half day sails, sunset sails, adventures on St. John, or the Soggy Dollar Bar or White Bay. Customized private charters available for groups, honeymoons, newlyweds, kids. Snorkel gear available. Guided snorkeling and snorkel lessons for all levels: beginner snorkelers to advanced free divers. Capt. Phil joins you in the water to teach and assist!